We will offer you a great video with Honda Civic Type R Mugen and Audi R8 V10 on public roads. 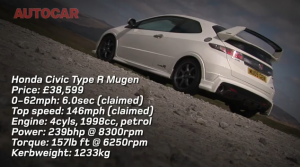 Honda Civic Type R Mugen weights 1.233 kg and has a 2.0 liter (4 cylinders) engine that develops 239 hp at 8.300 rpm and 213 Nm of torque at 6.250 rpm. Audi R8 V10 weights 1.625 kg and has a 5.2 liter V10 engine that develops 518 hp at 8.000 rpm and 528 Nm of torque at 6.500 rpm. Audi accelerates from 0 to 100 km/h in 3.9 seconds and gets to 315 km/h, all for 103.810 pounds. Honda accelerates from 0 to 100 km/h in 6 seconds and reaches 234 km/h, for 38.599 pounds.